Arthur Miller's character Willy Loman is the tragic protagonist in the 1949 play "Death of a Salesman". Miller's play is an enduring story about an aging and now mediocre salesman who has lost his enthusiasm for selling. Willy is in the twilight of his career. He does know his product well, maybe better than most of his peers. Great actors like Brian Dennehey, Fredric March, Dustin Hoffman, George C. Scott, Lee J. Cobb and Philip Seymour Hoffman have all portrayed Willy on stage and screen. There's no question that "Death of a Salesman was one of the greatest plays of the 20th Century. 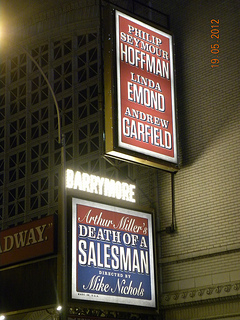 So what's Willy Loman got to do with the Death of a Franchise Salesman? Well I don't think Willy sold franchises? In the play Arthur Miller never reveals what Loman sells. Could you imagine getting into a car and going from town to town equipped with a briefcase and sell franchises in 1949? Who would ever do that? In 1952 Colonel Sanders did just that. 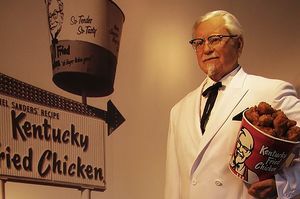 He traveled across country from Corbin, Kentucky to Salt Lake City, Utah to sell his first Kentucky Fired Chicken franchise to Pete Harman. And KFC franchising was born. I talk with a lot of people in across franchising at all levels. And franchise company presidents have expressed a concern. They think that they may have Willy Loman selling franchises for them. Not the tragic version in the play, but a failing franchise seller nonetheless. This is their perception right or wrong. Their solution however is to do something radical to change franchise sales and take them to unprecedented heights. They are going to automate the sales process so that an over-the-hill mediocre Willy Loman can sell or even Biff or Happy for that matter. Franchisors are buying into the hype that franchise buyers are going to self-discover everything they need to know about buying a particular franchise. And all you need do is automate this process for them. Here's how it's supposed to work in theory. Leads flow into the CRM. Candidates follow the application instructions and gain access to a series of steps or doors and learn what they need to know to buy the franchise. You can't get from one door to the next without successfully unlocking it. So all Willy, Biff or Happy has to do is guard the doors and assist the franchise prospect if they run into trouble with the CRM. Once the prospect completes the CRM process one of the Loman's schedules a Discovery Day to get the deal done. But one day Happy gets an idea! If he just unlocks all the doors and rushes franchise candidates through the CRM process he can get them to a Discovery Day faster and get more deals. How do I know this you say. I talked with Happy Loman about it and he told me. Don't get me wrong I like sales force automation. I have been using these databases for over 20 years. I think to do it right you need to first have your franchise sales process set up so that it works for both your candidates and your Willy, Biff and Happy. Using a CRM to keep the salesperson engaged, in control and attentive to your franchise buyers makes sense. So before you try to replace franchise selling with a CRM we should talk about why Mr. Loman is not selling as many franchises as you want to sell.